sturdy smooth surfaced (chrome plated) bottom ring for footrest makes it very popular amongst the doctors. 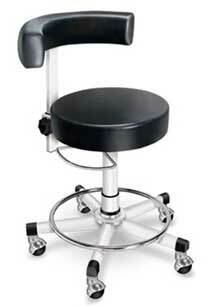 We are well reckoned as one of the leading doctor exam stool manufacturers and exporters from India. Easy â��tosit, poly urethane seat surface. Strong yet soft, semispherical, height adjustable backrest, offers optimal elbow, upper body & back support. Stable, epoxy coated five pronged base. Sturdy smooth surfaced (chrome plated) bottom ring for footrest. Smooth movments through five highquality castors.